Use bulk insert. This is the single most important thing you can do. This reduced the initial load time from ~8 hours to under an hour, and prevents the need to compact the database. Baseline time: 42 minutes, using 1,000 documents per batch. Don’t use the default _id assigned by CouchDB. It’s just a random ID and apparently really slows down the insert operation. Instead, create your own sequence; a 10-digit sequential number was recommended. This bought me a 3x speedup and a 6x reduction in database size. Baseline time: 12 minutes, again using 1,000 documents per batch. The more-than-exponential growth at the right of the graph is expected; however, the peak around 3,000 documents per batch is not. I was so surprised by the results that I ran the test 3 times – and got consistent data. I’m currently running a denser set of tests between 1,000 and 6,000 documents per batch to qualify the peak a bit better. Are there any CouchDB developers out there who can comment? You can find me on the #couchdb freenode channel as well. This entry was posted in Development, Random, Software and tagged couchdb by Wohali. Bookmark the permalink. 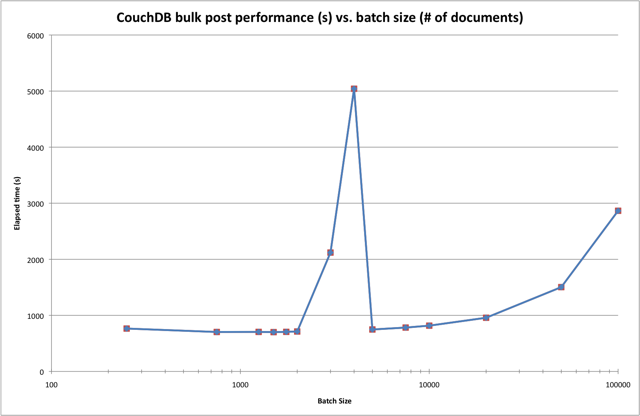 I *just* started looking at CouchDB today. I notice you mention using a sequential number. There’s a section on “Auto Increment IDs”. They seem to have a justification for doing what they’ve done. Hi Daniel, thanks for stopping by. There’s definitely some conflicting advice out there for the new person interested in CouchDB. The point made in the book is an important one – namely, that you don’t want a central single autoincrementing ID in a system that will have eventual consistency, lest you reinvent a single point of failure (and performance limiting). I need to draw a picture of this at some point, but the reason is if you think of the idealized btree, when you use UUID’s you might be hitting any number of root nodes in that tree, so with the append only nature you have to write each of those nodes and everything above it in the tree. but if you use monotonically increasing id’s then you’re invalidating the same path down the right hand side of the tree thus minimizing the number of nodes that need to be rewritten. would be just the same for monotonically decreasing as well. and it should technically work if you’re updates can be guaranteed to hit one or two nodes in the inside of the tree, though that’s much harder to prove. So it turns out that using an incrementing (or decrementing) sequence is useful, even if that sequence is just the number of seconds since UNIX epoch. And generating a timestamp at the time of document insertion is effectively free computationally – cheaper than generating 512 bits of pseudorandom data to be sure!. But how should you deal with the points mentioned in the Why CouchDB chapter? A suggestion is to prefix or suffix some identifier unique to each instance of the DB or application server (depending on your architecture – whether you’re using CouchDB-hosted applications or an external application server architecture like RoR or Django). Now you can be sure you’ll never have duplicate IDs, you can be sure that grabbing documents “near each other” (in an assumed time series) is straightforward, and that you don’t have a singleton design pattern bottleneck with a centrally determined sequence. Hmmm, it would be very interesting to run similar tests with MongoDB and compare the results. Hi Dwight, thanks for stopping by. I’ll take a look at MongoDB once this sprint is complete. Right now I’m not “shopping around” for DBs, just trying to figure out how to get the most performance out of the one I’ve chosen already. Pingback: CouchDB For A Real-Time Monitoring System | Stoat – Where? HI Evelyn, I’m afraid the units are long gone, but feel free to shoot me an email or similar with any specific questions you might have.